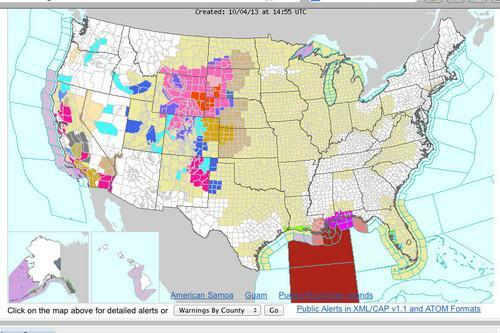 The U.S. National Weather Service's, Weather.gov, displays weather alerts Friday, despite a government shutdown. As a tropical storm and possible hurricane bears down on the Gulf Coast of the U.S., the National Weather Service's website was churning out weather alerts Friday, despite a partial U.S. government shutdown that has affected citizens' access to other online resources. The National Weather Service's website, Weather.gov, was one officials deemed as essential after a budget fight in Congress led to a partial government shutdown Tuesday. The website for weather service parent agency, the National Oceanic and Atmospheric Administration, displayed a notice saying it was unavailable during the shutdown. "Only web sites necessary to protect lives and property will be maintained," said a message at NOAA.gov. But Weather.gov displayed a map of the U.S. with current weather alerts Friday, including a warning for tropical storm Karen, with a hurricane watch for the Gulf coasts of Louisiana, Alabama, Mississippi and Florida. The weather service expects landfall by Sunday morning. "Because the information this site provides is necessary to protect life and property, it will be updated and maintained during the Federal Government shutdown," a message on Weather.gov said. The National Hurricane Center's website, at NHC.noaa.gov, also remained in operation. The website for the Federal Emergency Management Agency, FEMA.gov, also was operating at a limited capacity on Friday. FEMA is the main agency that responds to disasters such as hurricanes. "Due to the lapse in federal funding, portions of this website may not be updated and some non-disaster assistance transactions submitted via the website may not be processed or responded to until after appropriations are enacted," FEMA.gov said. Many workers at the Department of Justice and Federal Bureau of Investigation have remained on the job during the shutdown. Justice.gov was up Friday, although a notice said some portions were not being updated. FBI.gov was up, but had a similar message. The FBI announced the arrest of Ross Ulbricht, allegedly the operator of the drug-selling Silk Road website, on Wednesday, a day after the shutdown. The DOJ brought criminal charges against 13 people alleged to be members of the hacker group Anonymous on Thursday. The Patent and Trademark Office, and its website, UPPTO.gov, also remained open. Several other U.S. government websites were down this week. The Federal Communications Commission's website, FCC.gov, included this message: "We regret the disruption, but during the Federal Government-wide shutdown, the FCC is limited to performing duties that are immediately necessary for the safety of life or the protection of property. FCC online systems will not be available until further notice." The Federal Trade Commission's website was also closed. Consumers will not be able to file complaints or register for the agency's do-not-call list during the shutdown, the agency said. The National Security Agency's website was up, but a message said it was not being updated. Data.gov, the government's website for publishing agency data and statistics, was closed. Also down are NASA.gov, Archives.gov, USDA.gov and Trade.gov, the website for the International Trade Administration.